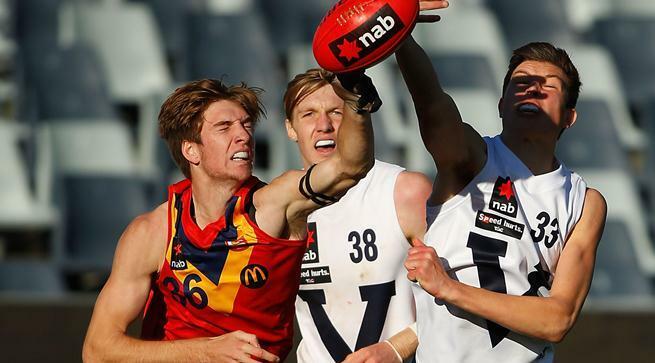 South Australia has extended its winning streak against Vic Country to nine matches in the NAB AFL U18 Championships, with a commanding 63-point win today at Simonds Stadium. Vic Country last won against SA back in 2006, and was unable to break its drought against the visitors as they faced a quick running and determined opponent. South Australia dominated play early, showing blistering speed and accuracy with their disposal. Kicking with the breeze in the first term, SA led the inside 50 count 12-4, and kicked five unanswered goals with the likes of Caleb Daniel (27 disposals), Josh Hone (14)and Dean Gore (11) damaging. Missed opportunities hampered Vic Country’s chances of getting back into the game in the second term, with Rowan Marshall missing three opportunities as SA kept the home side goalless in the first half. Leading by 36 points at half time, SA again made Vic Country pay for uncharacteristic turnovers, going coast to coast for their seventh goal of the game. Vic Country pushed the ball forward on numerous occasions for the term, but the breeze proved decisive holding up a number attempts at goal. It took until the 12 minute mark of the third term for the returning Pat McCartin to add Country’s first for the match, but the glimmer of hope that was created was quickly extinguished when Caleb Daniel – standing at 167cm tall – kicked two late goals to give SA a strangle hold on the game with a 51- point lead. James Rose put the game beyond doubt early in the final term with two goals. McCartin kicked his second goal at the 16 minute mark to be Country’s only goal kicker for the afternoon, but Luke Partington replied to give SA a 63 point win. Teia Miles led the disposals for Vic Country with 19 (7 kicks 12 handballs), followed by Rhys Mathieson (17 (6 clearances), Joe Maishman 15 (5 marks) and Nathan Drummond 15 (5 rebound 50s). Hugh Goddard had an entertaining dual with top SA draft prospect Sam Durdin, with Goddard restricting Durdin to 10 disposals and four marks, while producing 12 disposals of his own in defence. Vic Country will now face WA in Round 6, next Wednesday at Etihad Stadium (5pm). Country remains a game behind SA on the ladder, but need to make up 26% which makes it difficult to win the 2014.